The Endangered Languages Documentation Programme (ELDP) strives to document and preserve endangered languages by funding scholars worldwide to conduct field work and to archive their documentary collections and make them freely available. We intend to help two Ghanaian students attend a 2-week intensive course on Endangered Languages Documentation at SOAS in 2019. This will help facilitate the documentation of languages like Animere and Adele which are facing extinction in Ghana. These individuals will join the Endangered Languages Documentation Programme which will provide a tailored workshop, adapted to suit Ghana’s regional needs for language preservation. Our goal is to raise $5,000 total ($2,500/person). Our own and most important AFSOAS initiative - this scholarship opportunity provides one American student in financial need each year the life-changing opportunity to study a full-time, one-year taught Master's programme at SOAS in London. As part of this scholarship, the selected individual also receives free housing thanks to the very generous support of the Friends of International Student House London (FISHL). Five individuals to-date have received this scholarship. Our annual goal is to raise $30,000/year. 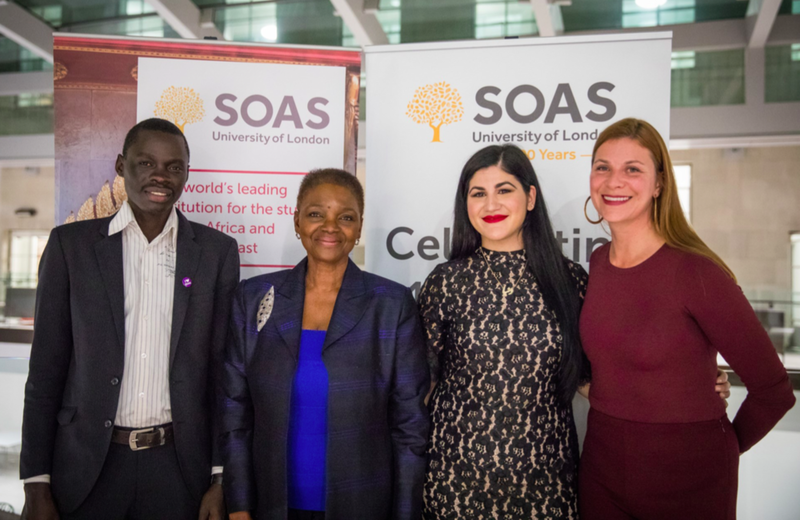 The SOAS Sanctuary Scholarships give displaced people, who cannot access student finance, a chance to enter higher education in the U.K.
SOAS is a Named Fund member of the Chapel & York US Foundation, Inc. The Chapel & York US Foundation, Inc. is a 501(c)(3) tax-exempt organization. Donations to the Foundation are tax-deductible to the extent allowed by law. The Chapel & York US Foundation will send you the receipt you need for your tax return.